These are high quality Christina Meyer FSC oak engineered floors on a birch plywood base. These floors are 20mm with a 6mm top layer of oak and a birch plywood base of 14mm. These are beautiful floors available in wide widths 180mm, 200mm and 220mm and in lengths from 600mm to 2000mm. A range of colours of finishes and colours is available: prime oak, rustic oak, and steamed oak available in lacquered or oiled options. Rustic is natural wood with closed knots in the colour of the wood and filled knots variation in colour and some sapwood and heartwood is allowed. Prime is a consistent colour with sound closed knots in the colour of the wood up to 10mm. 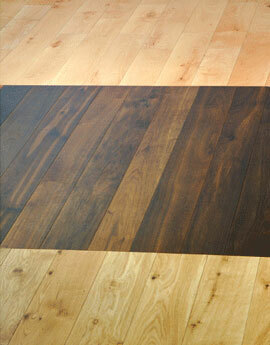 Steamed oak produces a colour and texture similar to black walnut giving a rich inviting dark colour.